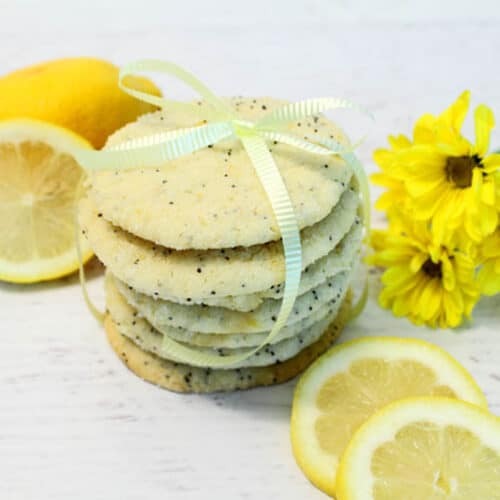 Celebrate summer with these Lemon Poppy Seed Cookies. Zesty cookies that pop with lemon flavor. Soft & chewy inside with a sugary crunch outside. In a small saucepan, bring the lemon juice to a simmer and cook until reduced by half, about 5 minutes. Add 1/2 cup butter (1 stick) to lemon juice and stir until melted. Remove from heat and set aside. In a large bowl, cream the remaining butter with 1 cup sugar until light, about 3 minutes. Continue to beat while adding in egg and lemon butter and whip another 3 minutes. Mix in vanilla and lemon extracts and 2 teaspoons of zest. In a small bowl, combine flour, baking powder and salt. Add to lemon butter mixture, mixing at low speed until combined. Stir in poppy seeds. On a flat plate, mix together remaining 1/2 cup sugar with the rest of the lemon zest. Pinch large fingerfuls of zest into sugar until well mixed. This will help flavor the sugar more thoroughly. Using a medium cookie scoop, scoop batter into 1-1/2? balls and place on ungreased cookie sheet. Set about 2? apart as they will spread slightly. Using a flat-bottomed glass, dip in lemon-sugar mixture then press cookie flat until it’s about 1/4? thick. Sprinkle with additional poppy seeds. Bake for 11-13 minutes or until just starting to brown around edges. Cool on cookie sheets for about 2-4 minutes then remove to wire racks to finish cooling. Store in airtight container. They would be very pretty made as smaller cookies using a small cookie scoop where you would probably get 3 dozen. Adapted from recipe found on Martha Stewart.